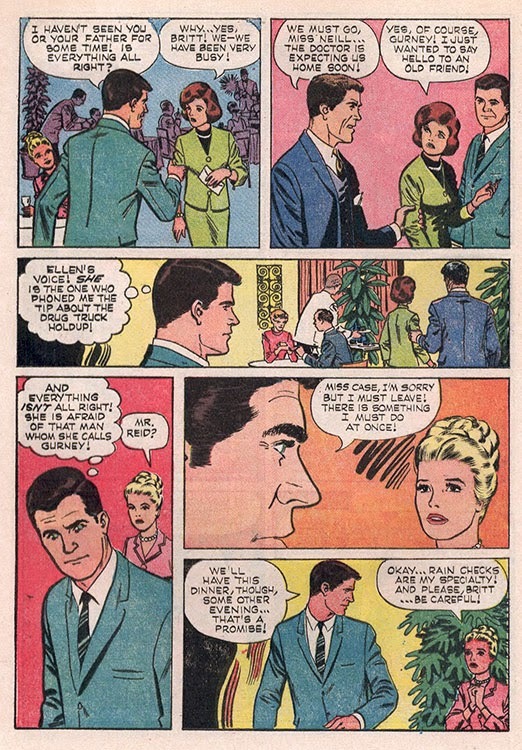 Secret Sanctum of Captain Video: The Green Hornet: the TV SuperHero Who WASN'T Based on a Comic Book! 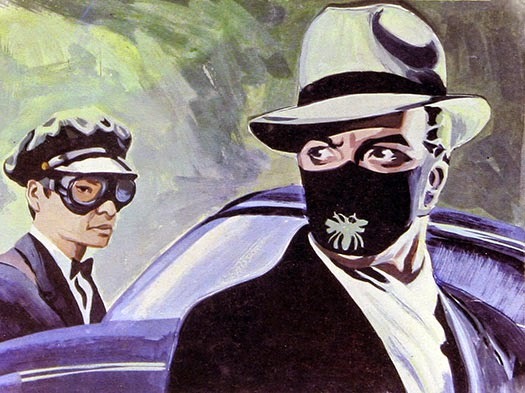 The Green Hornet: the TV SuperHero Who WASN'T Based on a Comic Book! On January 12, 1966, Batman debuted on ABC to absolutely astounding ratings! The whole country went "Bat-Mad"! Anything and everything comics-oriented sold like crazy! 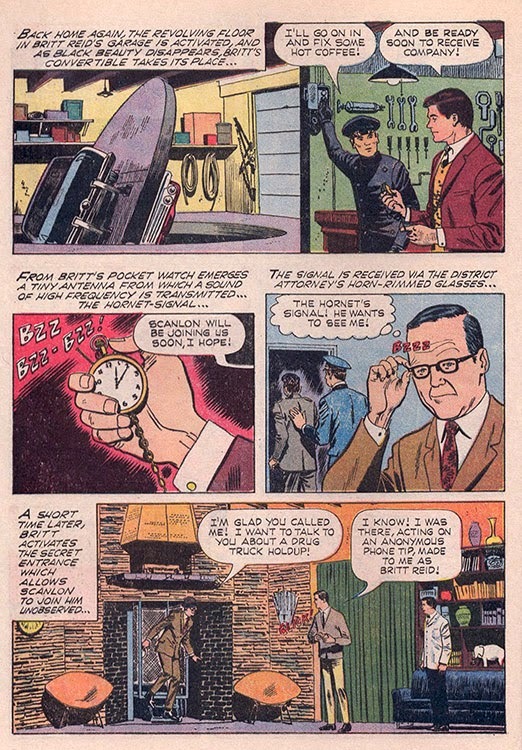 Radio syndicator Charles Michelson quickly put together a package of old superhero radio shows including The Shadow, Superman (which featured Batman as a guest-star), The Lone Ranger, and The Green Hornet and marketed them to local radio stations (where, in some cases, ratings doubled) as well as issuing them on lp record albums (which sold well). Meanwhile, ABC told Batman producer William Dozier they wanted MORE comic/super-hero shows. 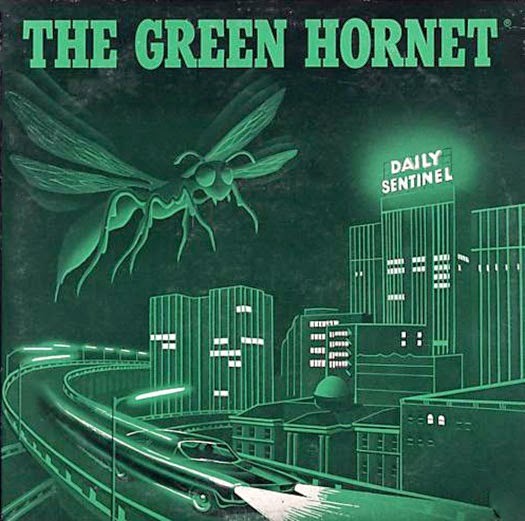 Dozier had been listening to the re-issued radio shows and decided The Green Hornet would make a good follow-up to Batman, despite the fact that the last new radio show aired in 1952, and the last new comic (which we presented HERE) was published in 1953! 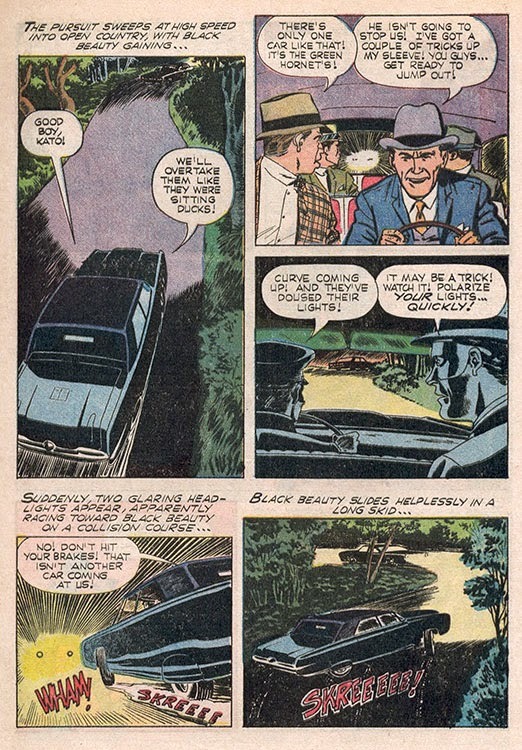 Both Dozier and original Hornet creator George Trendle felt the "camp" approach used on Batman would be inappropriate. Trendle pointed out that doing a "straight" version of his other character, The Lone Ranger, resulted in a long-running tv show and two successful feature films! So ABC agreed to do it their way...but with some "updating". The Hornet's mode of transport, Black Beauty, was upgraded from just being a really fast car to a really fast bulletproof car with, among other things, a flying tv camera, knockout gas projectors, and lethal rocket launchers. The Hornet retained his knockout-gas gun, but added an ultrasonic "Hornet Sting", which quickly became his primary weapon. 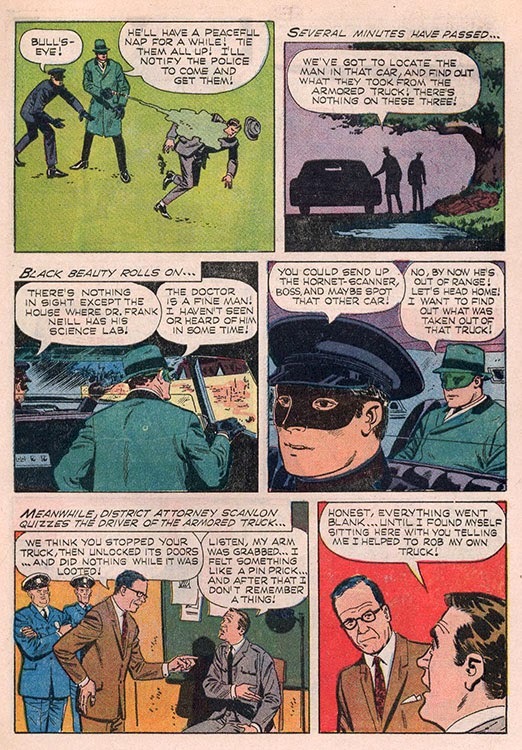 The Hornet's costume, as described in the radio show and shown in Golden Age comics included a full-face mask that would've required expensive and time-consuming redubbing whenever the character spoke, so it was modified to be a standard domino mask covering just the upper half of the face (see pic at top of page). In a compromise, there were no costumed super-villains, but the gangsters could use cutting-edge technology and unique weapons, like a radio-controlled leopard or a laser gun. ABC also insisted that "Flight of the Bumblebee" was too dated to be used as the show's theme. Dozier brought in jazz musician Billy May, who had previoiusly done music for tv shows like Naked City, to compose an updated version. The Green Hornet debuted on September 9th, 1966 to solid (but not Batman-level) ratings. On-set photo from the Batman episode "Batman's Satisfaction"
Despite several promotional stunts, including an appearance on Batman as a "visiting hero" (even though everyone, including Batman, thought the Hornet was a villain), the show was cancelled after only one year. It found a new home in reruns, which are must-see viewing, since the series is not available on DVD/BluRay! 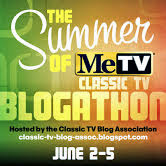 You can see it on MeTV every Saturday morning at 8am, Eastern time. 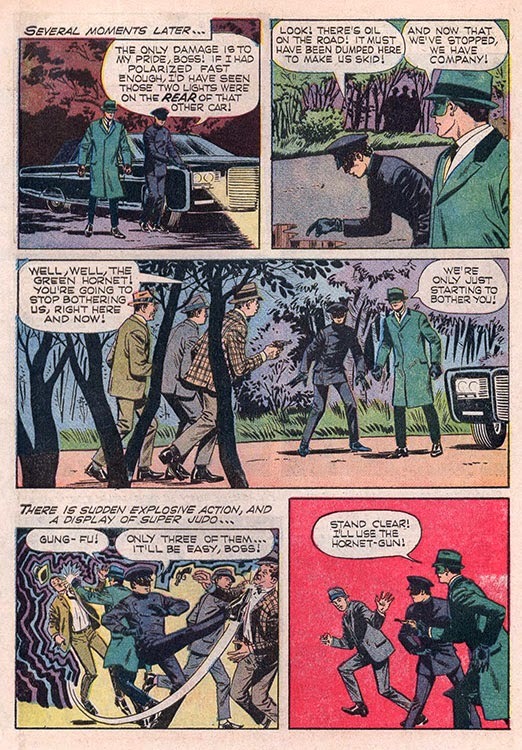 Ironically, since there wasn't a Green Hornet comic book at the time, a new series (based on the TV show) from Gold Key (the premier publisher of Silver Age movie/tv tie-in comics) hit newsstands in late 1966. 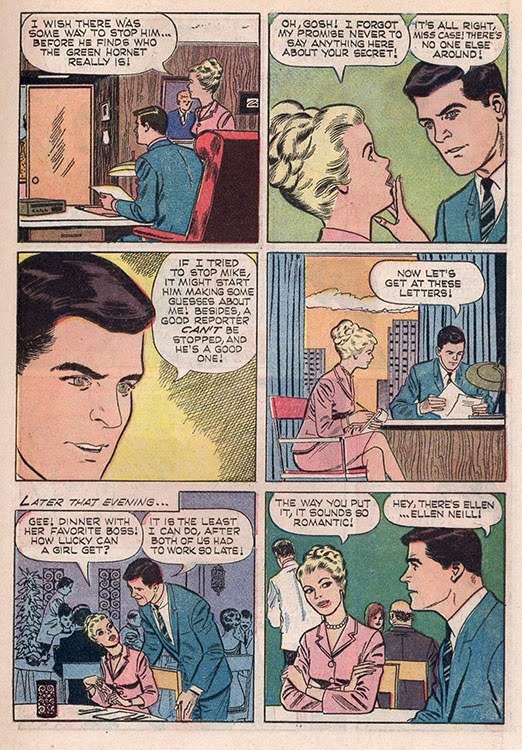 It only lasted three issues and has never been reprinted. 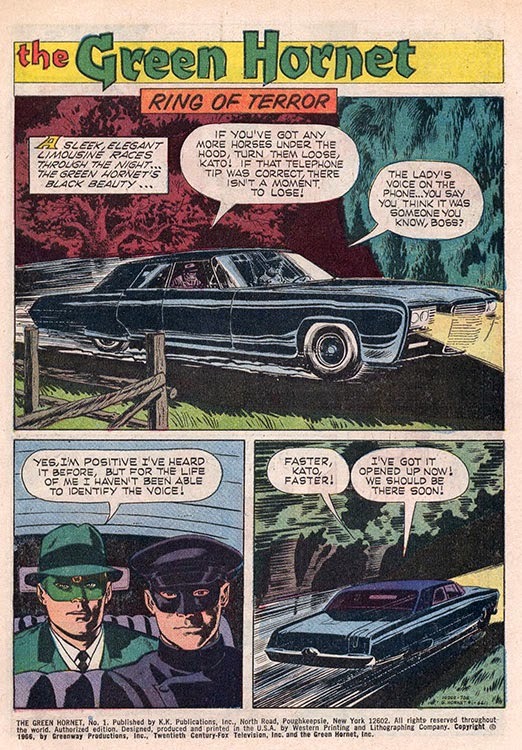 I really wasn't a fan of the Green Hornet. If you could enlarge the font it would really help. I found this hard to read. Not everybody has young eyes. However I did find the post interesting. Maybe if you changed the template. it would look better too. Took the font from 12 to 16 point, which should help. Really interesting piece - I remember The Green Hornet mostly for the terrific theme and, later, because of Bruce Lee. Not sure that I was a fan then, or that I would be today, but you've convinced me that I should record an episode or two and give it a try. Good work! To this day, I know people who only know "Flight of the Bumblebee" as The Green Hornet theme.I liked the series better than BATMAN, which started off as fun, but grew tiresome. I enjoyed Kato, but didn't fully appreciate Bruce Lee until after he took the world by storm in his martial arts film. Now, his fight scenes alone make THE GREEN HORNET a blast to watch. 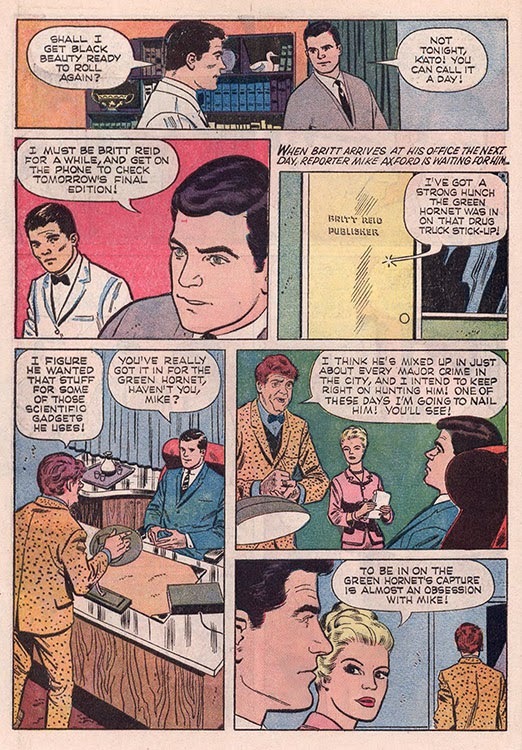 I'm amazed there wasn't an earlier comic book series. Love the panels that you included in your well-done post! 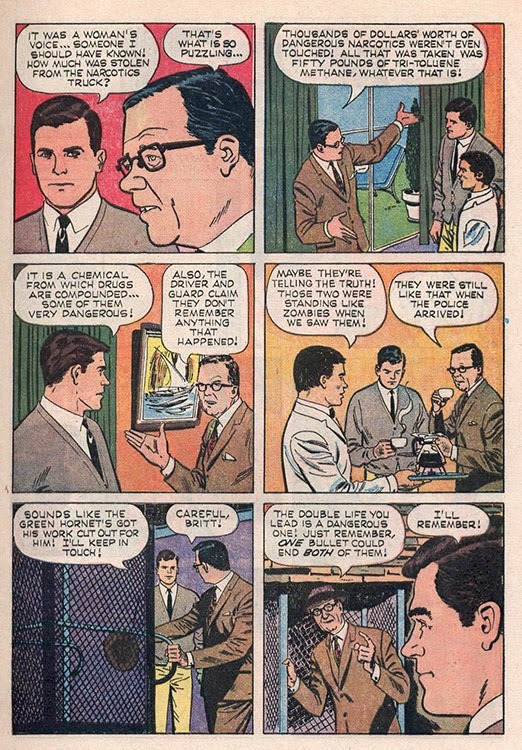 There were comics from three different publishers, all based on the radio show. We've presented several of those stories on this blog. 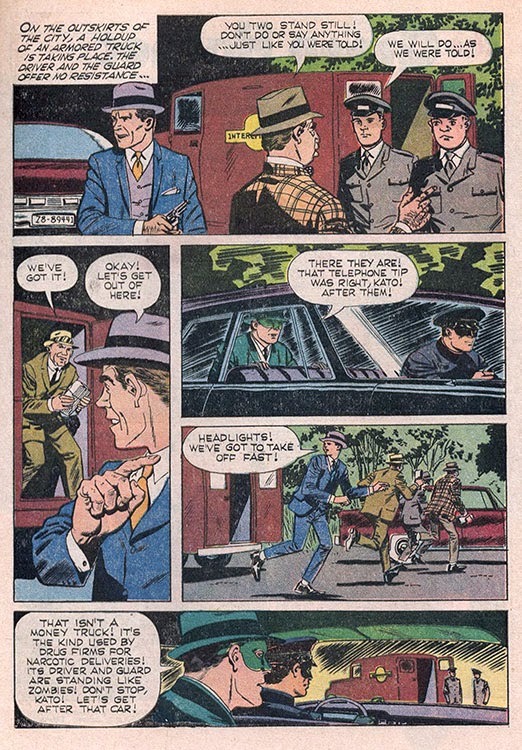 Check Friday's post for a complete list of links to previous Green Hornet posts! Wow, these strips are fantastic! Thanks!! !